Reloading ammo not only saves you money but is also a lot of fun. The fun factor goes up even more if you have the best reloading tumbler to help you clean the case. To get the maximum benefits however you’ll have to get the right tumbler for the job. This can be difficult especially if you’re not familiar with reloading tumblers and how they work. 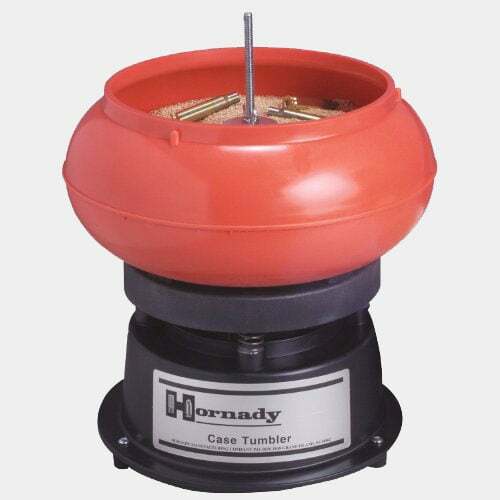 A reloading tumbler allows you to complete hundreds of case cleanings in just a few hours. And the best part is you don’t need to do much. All you do is put in cleaning media, some polishing powder and your used case. Shut the lid, turn the tumbler on and in a few hours you’ll have your cleaned case ready for use. 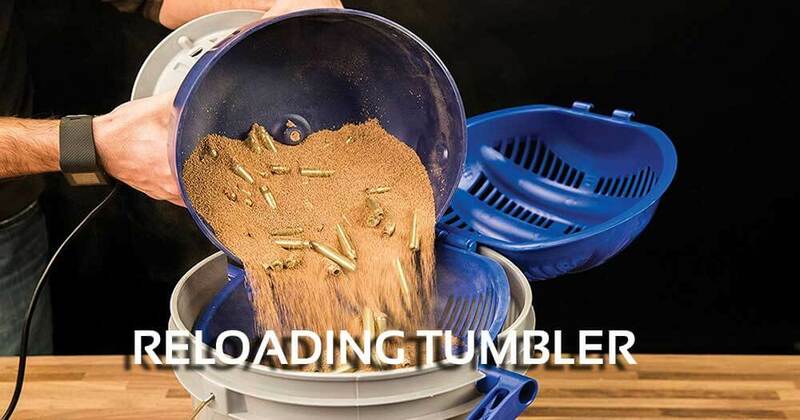 But which of the many reloading tumblers should you buy? Well, I’m going to save you the trouble of looking as I have reviewed the top 3. 3 What is the Best Reloading Tumbler? 5 Who Makes the Best Reloading Tumbler? The Quick n EZ makes brass cleaning, as its name says, quick and easy. Its capacity is good for 350 223 cases or 600 9mm cases, and that alone makes it one of the best tumblers for reloading. 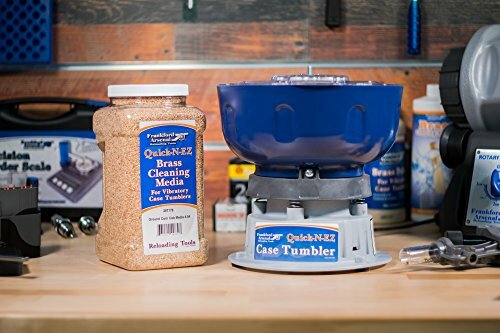 Made for use with the Frankford Treated Walnut Hull Media and the Corn Cob Media, the Quick n EZ removes oxidation and fouling quickly. Its specially made bowl speeds up brass agitation for faster cleaning. By using this tumbler you’ll minimize casing wear on the brass and prolong the life of reloading dies. The clear lid enables you to see what’s going on. The tumbler runs smoothly and functions well with the Quick-N-EZ Rotary Separator to separate brass and media. You don’t even need to fill the tumbler the whole way to get results. Just fill it about 2/3 on the way up or about 2 lbs and put your cases in. You can use different types of brass and the results will still be the same. The Quick n EZ is just the right size for the hobbyist, and it does not make as much noise as other tumblers. Aside from Frankford cleaning media you can also use grounded walnut shell or lizard bedding. With the Quick n EZ you don’t even have to put in artificial chemicals. The Lyman Pro has a 350 case per cycle capacity, making it one of the best affordable reloading tumbler available. The integrated sifter lid helps a lot in separating media and it’s also a cost-saving feature. The Lyman Pro does a good job of speeding up the cleaning procedure but without compromising the results. Being able to clean up 350 cases per cycle also makes a huge difference in productivity-wise. For a lot of people, the best part of the Lyman Pro 1200 is not needing a case separation tool. Having a rubber lid and rubber feet reduce noise when the tumbler runs also helps. There is thermal protection for the motor to minimize the risk of overheating. The motor itself is one of the potent in its range and runs at optimum level even when full. Just put in any Lyman dry media and add the cases. Turn the tumbler on and it will take care of the rest. The Lyman Pro has a uniquely made which provides cascading movement. This leads to media and case circulation and superior polishing. What the Lyman Pro does is work the cleaning elements more so the case comes out looking polished. What’s even better is this doesn’t even extend the cycle time. The Hornady M2 makes my list of the best tumbler for rotary reloading list for its completeness and ease of use. Running at 110 volts, the M2 was built specifically to clean brass without causing damage. The Hornady M2 cleans a lot of different cases and it does so much more quickly than regular reloading tumblers. The M2 is also one of the best in removing foreign particles so they don’t cause any damage to the case. The M2 is also one of the fastest in cleaning and it does so without damaging the case. Even if you’re new to reloading it won’t take long until you get the hang of it thanks to the easy to follow manual. The M2 is also durable, designed to clean hundreds of cases one cycle. The M2 provides consistent performance and true to claim, it doesn’t make as much noise other reloading tumblers. The tumbler is not completely quiet but moves a few feet from it and the sound is barely noticeable. There are a lot of good reloading tumblers around, but few of them can match the Hornady in terms of performance and capabilities. It is also one of the easiest to use as you just add the cleaning media, put the cases in and the tumbler will do the rest. What is the Best Reloading Tumbler? All reloading tumblers will claim to be the best, but I know from experience that is far from the truth. I’ve tried a lot of these and the 3 I reviewed here belong on any best reloading tumbler list. Reloaders look for certain things in tumblers, namely capacity and ability to remove fouling, lube and other particles. You also want them to provide consistent performance and with the tumblers here that’s what you get. I will choose a winner from the three here, but for now, I can say that you really cannot go wrong with the three here. The best reloading tumbler for the money should meet your current requirements. Here are some factors to bear in mind. 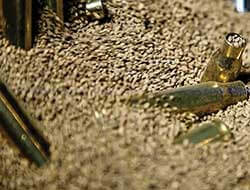 Reloading tumbler capacity is measured in the number of cases it can clean per cycle. A good tumbler is good for about 350 cases per cycle though the amount may vary depending on the case being cleaned. A reloading tumbler that holds up to 2 lbs of media should be good enough for most users. Heavy reloaders may need more but for casual users and beginners, this will be sufficient. A reloading tumbler is supposed to be easy to use. You place the cleaning media in the bowl, add the dirty cases, turn it on and the device will do the rest. At least that is how it’s supposed to work, as a few tumblers are more difficult than they need to be. You can avoid this problem by purchasing reloading tumblers from reputable brands. Separating media can be frustrating if it requires a separate sifter. That is why the best have this feature built in so you don’t need to purchase another product. If you’re going to use the tumbler for thousands of cases, it must be made of durable materials. You also have to make sure the motor is powerful but won’t overheat when it’s cleaning hundreds of dirty cases. The lower the noise level the better, and the good thing is most of these tumblers have noise reduction features. Who Makes the Best Reloading Tumbler? The best brands by far are Lyman, Hornady and Frankford Arsenal. Frankford has been around for a long time and since then it has gone on to manufacture high-quality reloading supplies including tumblers. If you have spent any time reloading ammo, the names Lyman and Hornady will be familiar. Through the years these two companies have been consistently making reloading tumblers and other products for shooters of varying skill levels. Bottom line is when it comes to quality reloading tumblers these are the names you can count on. 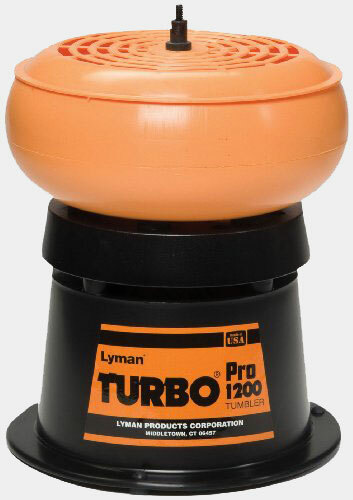 The four reloading tumblers I reviewed are excellent, but the best overall is the Lyman Pro 1200 Turbo Tumbler. It is easy to use, cleans cases quickly and doesn’t disappoint performance wise. It comes with a powerful motor and makes short work of even the dirtiest cases. Media case separation is well implemented and its ability to remove lube, oxidation, and fouling are exceptionally good and quick. This is not to say the Frankford Arsenal and the Hornady aren’t any good because they are. It is just that the Lyman Turbo is much more effective. And that is why I picked it as the best reloading tumbler.